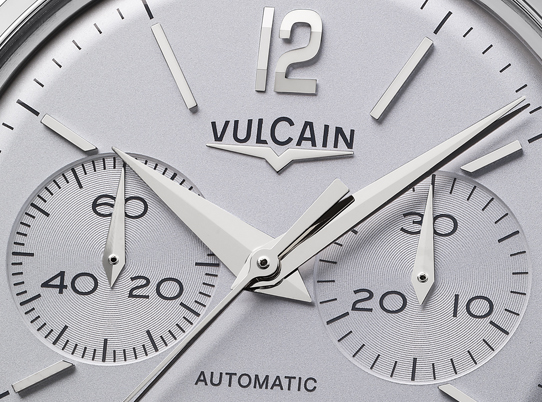 The Vulcain watch manufacturer was founded in 1858 and is the inventor of the alarm complication for wristwatches. American heads of state Dwight Eisenhower, Harry Trumann, Richard Nixon and Lyndon Johnson all wore a Vulcain on their wrist, earning the brand its reputation as “The Watch for Presidents”. Vulcain has also a prestigious past in sport. In 1934 Vulcain chronographs were adopted by the Real Madrid soccer team, winner of the Spanish Championship of that year. To celebrate this glorious past, the Manufacture from Le Locle presented the 50s Presidents’ Chronograph Heritage, a re-edition of the vintage model in a contemporary 42 mm size. Maintaining the graphic design of the original dial, it is available in three versions: black with brown transfer, “eggshell” white with black transfer and silver-toned with blue transfer. The font used is exactly the same as on the historical model, especially for the logo and the numerals. In addition to the minute circle around its circumference, the dial is enlivened by a pulsometric scale underscored by the inscription “Gradué pour 30 pulsations” (graduated for 30 heartbeats). 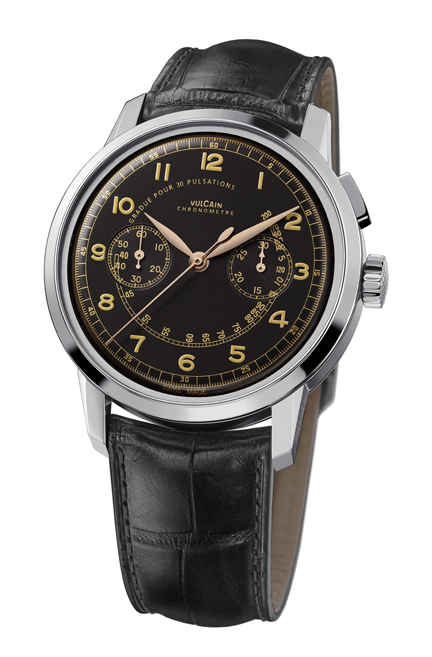 The legend “chronometre” appears below the Vulcain name at 12 o’clock to remark this chronograph’s vocation for excellence. 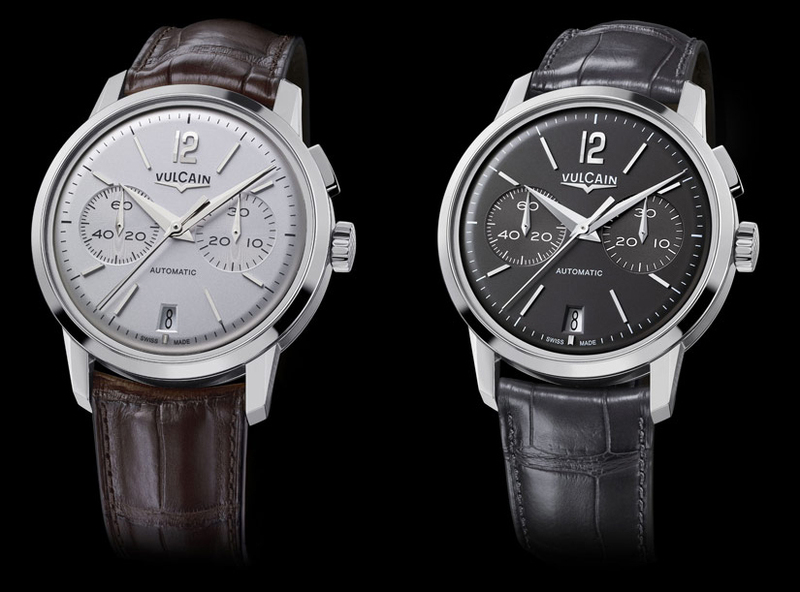 Vulcain is also introducing a new range of self-winding single-pusher chronographs named 50s Presidents’ Chronograph adopting the same movement and case size of the Heritage version but with a different dial, without pulsometric scale and Arabic numerals except for the 12 o'clock. The two main versions have silver and dark fray dials and are available in stainless steels and rose gold. 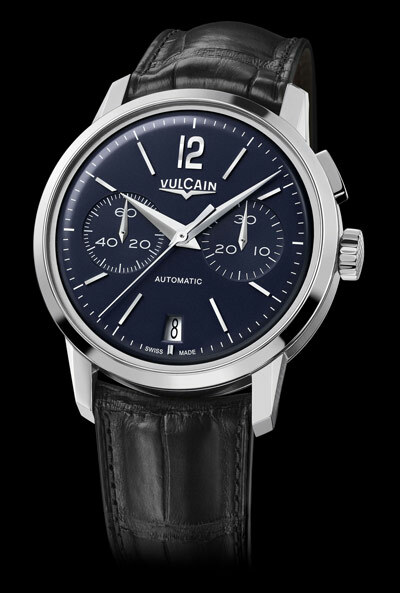 A third version with blue dial is available only in stainless steel. The case back has a sapphire-crystal that let the owner see the Calibre V-57 self-winding chronograph mechanism, oscillating at the frequency of 28,800 vibrations per hour and providing a 42-hour power reserve.